Google Glass meets … French Horn? Wearable camera technology could offer a new window into centuries of Classical Music tradition. That could happen not only via Google Glass but other online and camera tech, too. 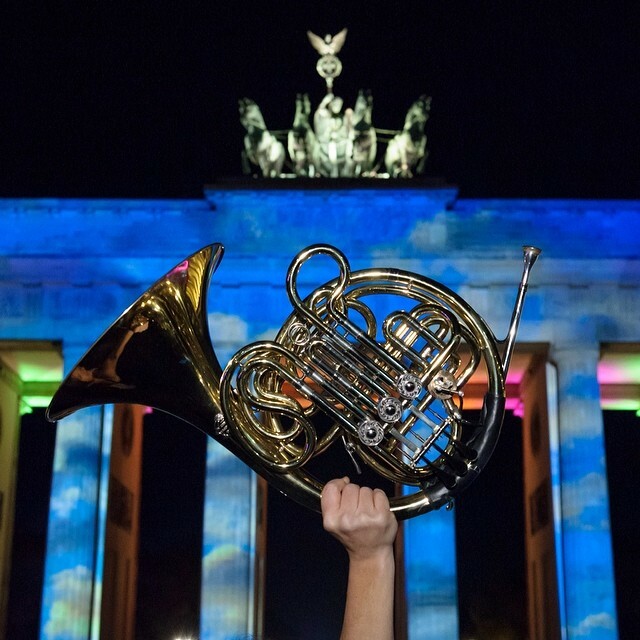 Sarah Willis, French Horn player, is using Glass as a way to bring young people closer to the Classical experience. And Willis is allowing people to see the point of view of an experienced artist in a symphony, watching conductors, and (depending on instruments and playing technique) the instrument itself. Sarah spoke to Berlin’s NEXT Conference yesterday, a tech conference. I spoke there, as well, and showed off gestural music performance techniques and live-generated Twitter music. Because NEXT attracts very much a non-musical – and to some extent, lots of non-tech – audience members, it was a chance to reach some different people. It’s worth watching the conversation, too, as Sarah is really upfront about the potential and some of the limitations of the tech. Glass, worn as eyeglasses are, can’t clearly show horn playing technique, and Google disabled live Hangouts. But these are early days, and some of the obstacles are as interesting as the early accomplishments. In our more connected, more camera-oriented, more social Internet age, the experience of even Classical Music can be richer than ever. And for those of us passionate about this music, that’s great news. I’m curious to hear what readers are doing in this area; it’s a chance for some discussion, no doubt.